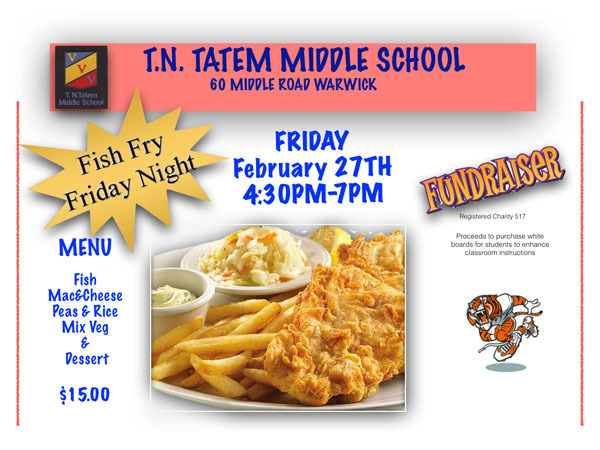 T.N Tatem Middle School is getting set to hold a charitable fish fry on Friday, February 27 from 4.30pm through 7.00pm, with the meal to include fish, macaroni and cheese, peas, rice, mixed vegetables, and dessert for only $15. A spokesperson said, “There is a continuous need for support in all areas. For example, we offer The Quinton Edness Scholarship, available to several of our students who meet the necessary requirements upon leaving to attend senior school. “Even with the age of technology, we still have a huge need for photocopy paper, additional learning aids to enhance classroom learning, library books, IT support, sports equipment, and so much more. Our monthly fish fry is just one of the ways we are able to raise funds for the school while bringing the community together.